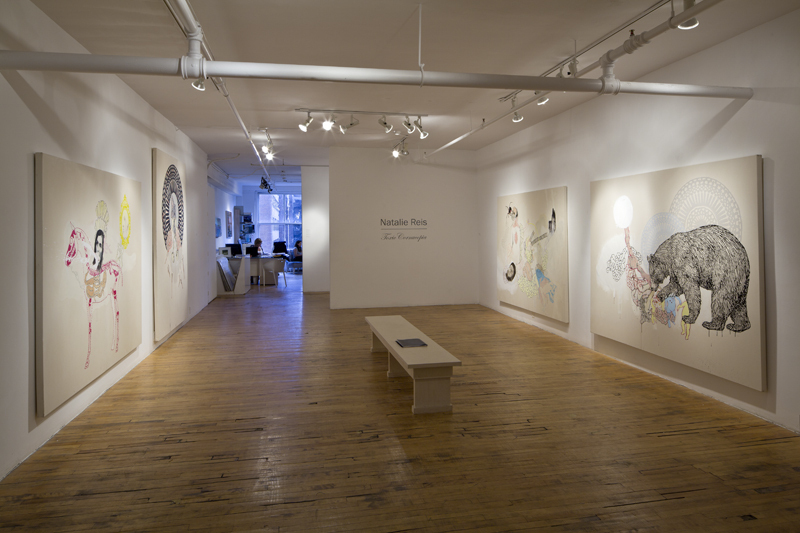 We are thrilled to present Natalie Reis’ second solo exhibition Toxic Cornucopia from April 30th to May 28th. 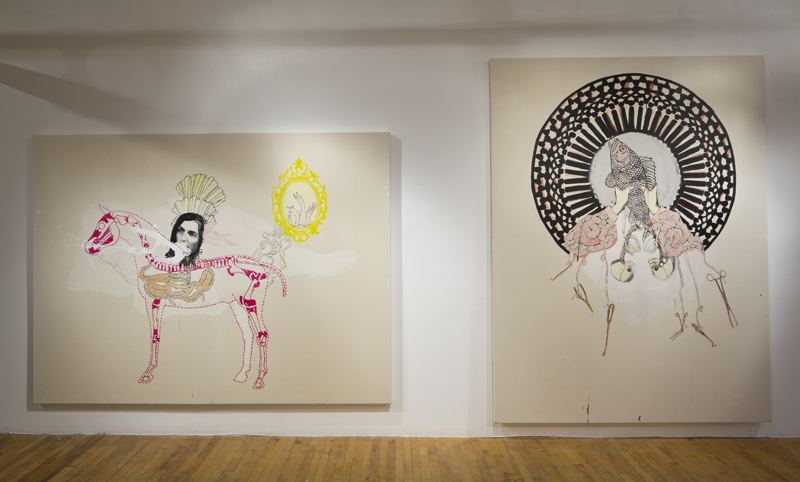 The young painter previously exhibited her work at the gallery in 2009 in an exhibition entitled Idols and Creatures. This emerging artist has already caught the attention of noted critics and collectors. 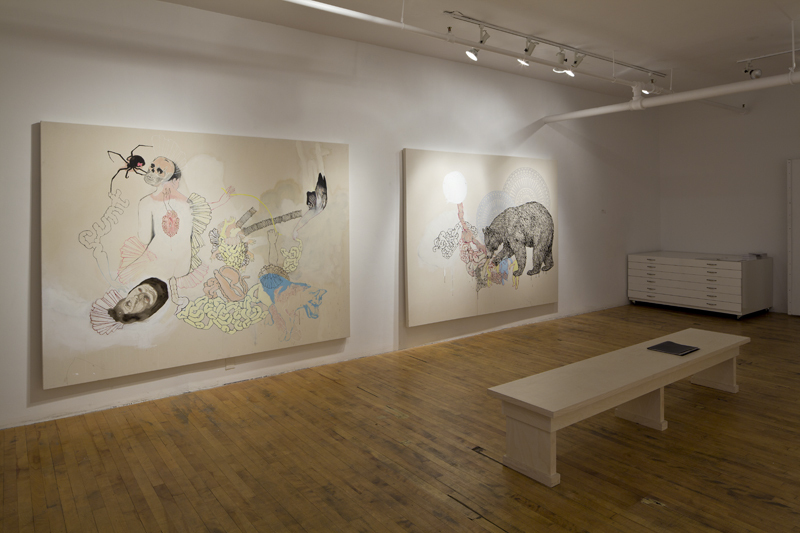 Reis’ most recent work reflects a rich and complex aesthetic. 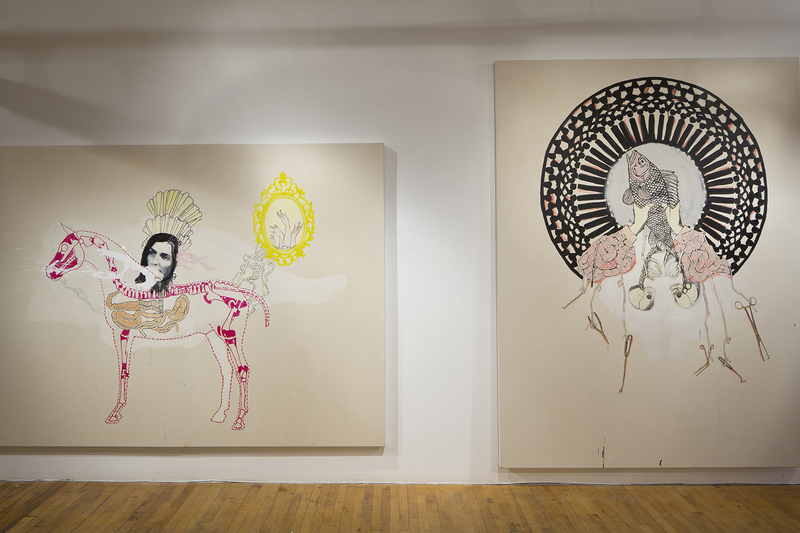 Her large-scale pieces embody at once the figurative, the allegorical, the theatrical and the popular by juxtaposing various symbols and icons that occupy our collective consciousness. Through her elaborate compositions, in which the play between subjects is at once artifical and psychoanalytical, Reis aims to illustrate the tension that exists in our relationship with visual language today – an anxiety that underlies our sense of mistrust in face of concocted realities. Reis’ art practice begins with the accumulation and appropriation of found imagery. By creating an illusionary environment in which she mingles and merges icons, symbols and references from mythology, art history, news and popular culture, the artist attempts to disarm the viewer’s sense of perception. She demonstrates a clear interest in the ambivalence between reality and fiction. While a political and clearly feminist tone underlies the ambiguity of Reis’ works, their aesthetic, at once graceful and disturbingly primal, buoyed by a masterful technique, serves first and foremost to stimulate and challenge the viewer on a sensory level. Natalie Reis is a figurative artist based in Montreal. She obtained a Master of Fine Arts degree from Waterloo University and a Bachelor of Fine Arts degree from Concordia University. 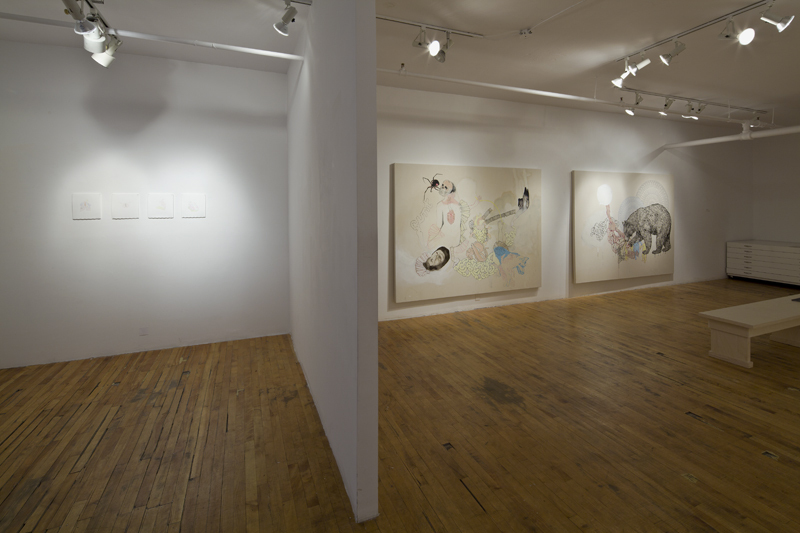 She has shown her work in numerous collective shows, at Usine C, Montreal 2009 Biennale, in the 2006 exhibition Fait à Montréal Made curated by Marc Séguin, as at international art fairs such as Red Dot in Miami.